The Environmental Advisory Group (EAG) is comprised of representatives from environmental organizations, as well as local, state and federal agencies. The input regarding local needs, concerns and environmental impacts being provided by the EAG is crucial in the evaluation of the project corridor. The study project team typically meets with the EAG up to three times during the study to ensure open communication and provide a forum for issue identification and resolution with governmental agencies and environmental groups. The Project Advisory Group (PAG), comprised of stakeholders within the project corridor, is an important component of this study. The input regarding local needs, concerns and environmental impacts being provided by the PAG continues to be crucial in the evaluation of the project corridor. The study project team typically meets with the PAG up to three times during the study to ensure open communication and provide a forum for issue identification and resolution with project stakeholders. 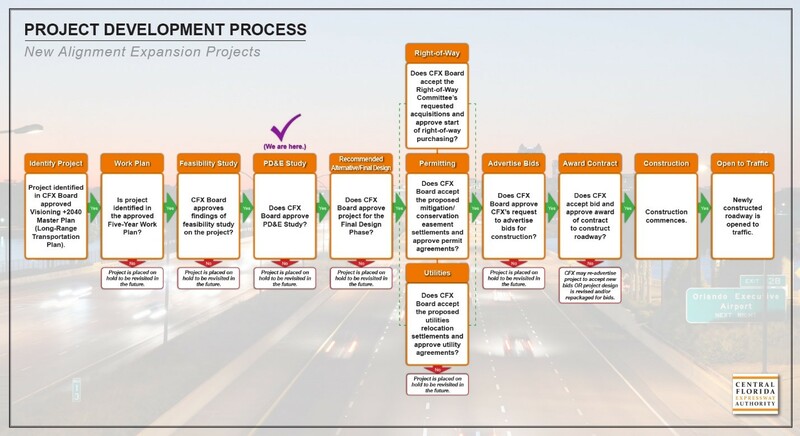 The Central Florida Expressway Authority (CFX) is conducting a Project Development and Environment (PD&E) Re-evaluation Study for the proposed Osceola Parkway Extension. 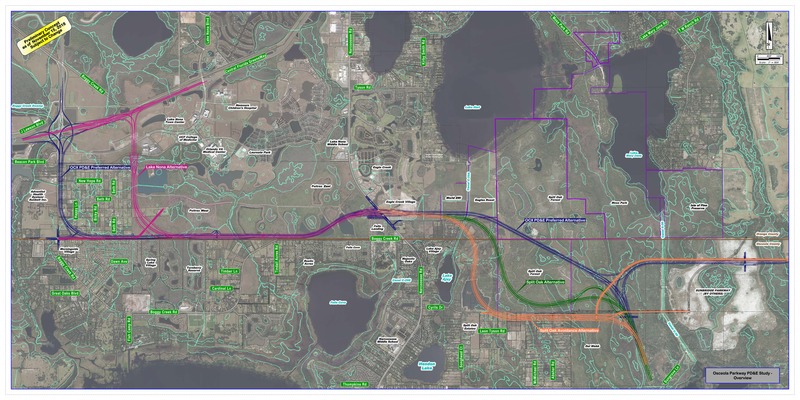 The study will look at a new expressway connection between State Road 417 near Boggy Creek Road in Orange County and the proposed Sunbridge Parkway in Osceola County. The goals of the proposed 9-mile, limited-access facility include providing for additional east-west capacity within the project area, enhancing mobility of the area’s growing population and economy, relieving congestion on local roads, providing for the incorporation of transit options and promoting regional connectivity. The Osceola Parkway Extension has been identified as a need in several local, long-range plans and master plans. 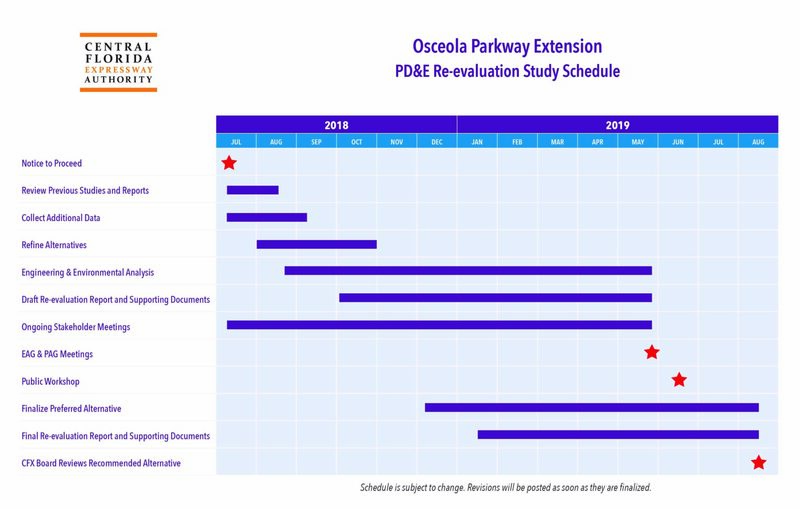 The Osceola County Expressway Authority (OCX) completed a PD&E Study in May 2017 for the Osceola Parkway Extension and presented a recommended alternative alignment. As part of an interlocal agreement, OCX requested that CFX incorporate the parkway extension and remaining portions of the OCX 2040 Master Plan into the CFX 2040 Master Plan. CFX recently completed a Concept, Feasibility, and Mobility Study for the Osceola Parkway Extension and concluded the project is viable under CFX criteria. The CFX Board in March of 2018 approved the findings and is moving forward with a Project Environmental Impact Report Re-evaluation. This re-evaluation will review, evaluate and compare the recommended alignment alternative from the OCX PD&E Study with the alignment alternatives and findings of the CFX concept study. The process will lead to a recommendation for the most appropriate alignment alternative for the Osceola Parkway Extension project. The PD&E study begins in July 2018 and is expected to last nine months. Public involvement and community engagement will be a crucial component of this PD&E study. Previously, during the four Concept, Feasibility, and Mobility Studies that included this proposed extension, more than 1,300 people attended six public workshops, where they offered more than 630 comments. Part of the community input process included 10 Environmental and Project Advisory Group meetings and nearly 60 stakeholder meetings. Below are the two Split Oak Forest Wildlife and Environmental Area (SOFWEA) alternatives presented at a Lake Ajay Homeowners Association meeting Nov. 15, 2018. Property owners near a proposed transportation project often want to know an agency’s process for buying needed private property. Click here for the Central Florida Expressway Authority’s policy on right-of-way acquisition. 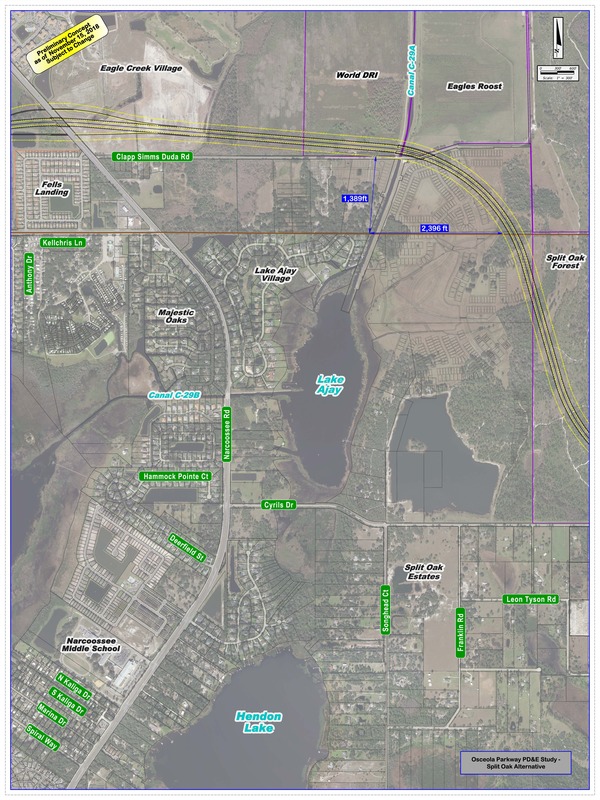 For information gathered prior to the PD&E study phase, please visit the Osceola Parkway Extension Concept, Feasibility and Mobility Study page. To submit a question or comment, please complete and submit the form below.